Being a year of the dog, you would definitely be looking for where to dine this year for your Chinese New Year. Ruyi which is one of the creative restaurant in Klang Valley and often surprise us with choices, food plating and Instagram friendly dishes does not disappoint us this year. Start your year off with the lou sang where you can enjoy the Instagram friendly delights which is the “Wong Choy”. The beautiful lou sang brings you with the little cute doggie which is significant the year of Dog. And with this you can have this “Wong-Choy”Paw-perity Yee Sang! RuYi had make it even special with the added egg-yolk crispy fish skin and atlantic salmon. Once a bite, you will definitely in love with it where the dish are addictively good. The highlight of the night- The beautiful grouper which is deep fried on its bones and the meat is cooked in the soup. Love how the soup taste where the soup brings you with the kick of spiciness in in it. It is slightly spicy but it’s super addictive too. We love how the soup is cooked with the sweet fish fillet and the greens. A twist of Japanese in it, the cod fish are perfectly marinated and the flavours are well infused in to the dish. The juicy cod fish are nicely glazed with honey with the hint of sweetness and they are sides with the mango salsa for a more refreshing after – taste. Lamb lover would definitely give this a two thumbs up!. Grab this lamb rack which is perfectly marinated till perfection and skilfully with the tender moist texture. The meat is just nice as it is and the flavours are well infused into the lamb making sure that every mouthful is perfect and divinely good. Have the prosperity prawns where the tiger prawns are being steamed and then topped with the green ginger. Sides with the Glass Noodles. Enjoy this awesome-licious prosperity prawns which they are packed with flavours in it. The prawns are fresh and bouncy too. 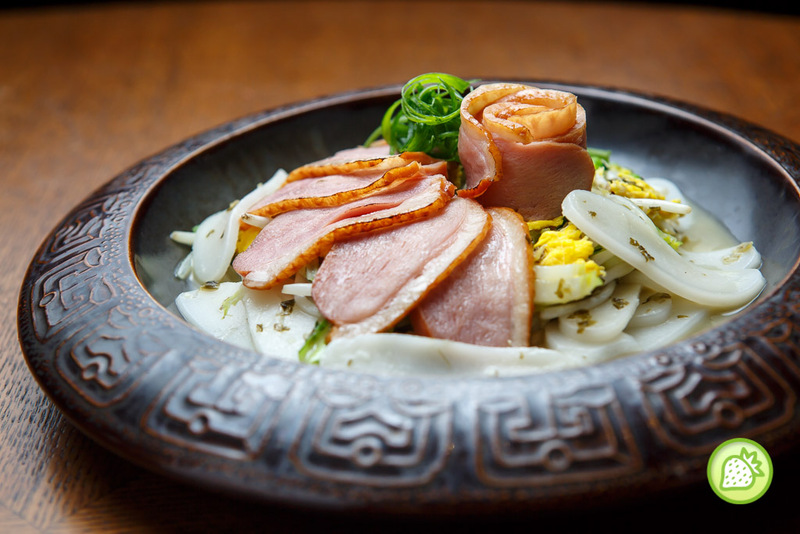 A bowl of flavourful dish where the rice cakes are made in house with and they are packed with the pickled vegetables and topped with the smoked duck. The dish are completely packed with flavours in it. And of course, all good food must end with desserts. Chef surprise us with the “nian gao” which is just melts in the mouth. The nian gao here is home made from the kitchen and it is not too sweet too. Love the soft chewy texture of the nian gao here. These are unique too where the glutinous rice ball ( sesame inside) are being fried. And this is my first time having this and I could say is a unique combination. Ruyi’s Chinese New Year Menu starts from MYR 138++ for 6-course meal (min 2pax) and MYR1,388++ onwards for 8-course meal in a bigger group of 10 pax.